Radian Introduces a Thermoelectric Assembly (TEA) Product Line » HHP Associates, Inc.
Radian is introducing a new thermoelectric assembly (TEA) product line. On September 4, 2018, Radian Thermal Products, Inc. announced that it has launched a thermoelectric assembly product line to manage heat dissipation and precise temperature control for the medical and industrial markets. Many medical, and industrial systems require precise temperature control and large heat dissipation which can be effectively achieved using thermoelectric assemblies. A typical TEA system consists of a thermoelectric module, two heatsinks with fans or a cold plate. 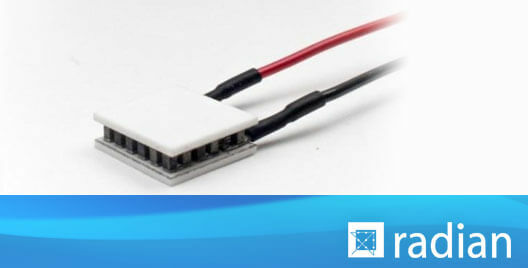 Radian’s thermoelectric modules (TEM) are available in sizes ranging from 4×4 to 55×55 mm with cooling capacities of 1 to 325W. All TEMs are designed for prolonged high-temperature applications with no performance degradation. We are honored to serve as a manufacturer’s rep for Radian. Radian Metal Products offers precision machining, and precision casting. Radian Thermal products offers value-added thermal design solutions for the advanced microelectronics and components industries worldwide.